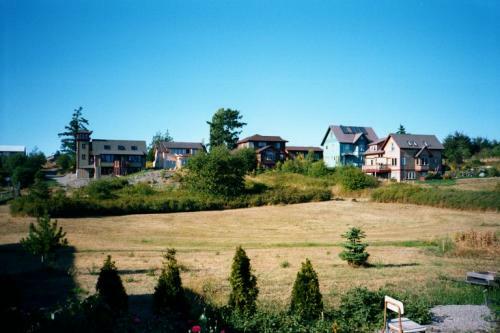 RoseWind is a cohousing community within a liberal small town of 9000 on the NE corner of the Olympic Peninsula. Seattle is about 3 hours away. Our views are pastoral, yet we are minutes from everything in town, including a good food co-op, farmers' market, seasonal festivals, many music and arts activities, boating, and generally the sort of culture you'd find in a college town. The climate is moderate. Our 24 households include all ages and many lifestyles. There's abundant music, food, social interaction, and of course the shared work of caring for our common areas. Our attractive community hall is used often, for meetings, shared meals 1-2 times a week, parties, workshops, rehearsals, slide shows, concerts, and meetings. We know our neighbors and help each other out in many ways. Neither "mainstream" nor far-out, we do our best to learn to live more sustainably by sharing, raising organic fruits and vegetables, and individually making informed environmental choices. Organizationally, we have learned a lot in 28+ years of consensus-based decision making. The extra time it takes to decide things is outweighed by the satisfaction of finding win-win solutions. Fully built, the way to join at this point is via resales, which are posted on our website www.rosewind.org. It is advisable to get to know us ahead of time, though, to be able to make an informed choice if a resale comes up. Check us out!